In the continuing struggle to protect and preserve our liberties, the crew of Eagle Too has struck a significant blow for freedom. I feel I’ve been channeling my inner William Wallace. 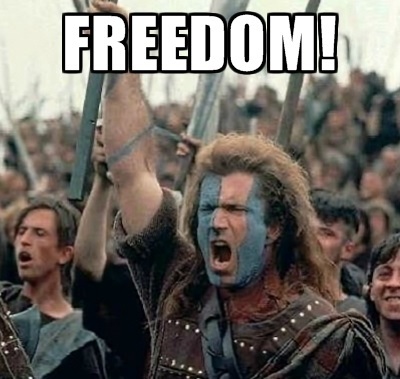 In a bold act of defiance, we have successfully escaped from the oppressive tyranny of artificial expiration dates. Let me explain. As I’m sure most of you are aware, boaters are required to carry daytime and nighttime signaling devices for emergencies. The most common one carried is the handheld flare. 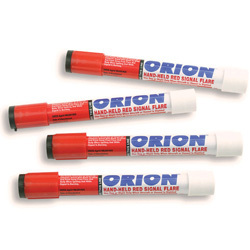 As emergency signaling devices go, these are probably among the worst things possible to use. Why? Because they’re flat out dangerous. They burn at something like 2000°F, and you have to be darn careful to not set your boat or yourself on fire, which we can safely say would make an already bad situation worse. In addition to being extremely hazardous, they also only burn for about 90 seconds. The requirement is to have a minimum of three day/night signals onboard, which is only going to give you about five minutes of use. Past that point, you’re back to waving your arms and yelling to try and summon help. So why are they so popular? Because it’s about the cheapest and easiest way to meet the USCG requirement to have signaling devices onboard. 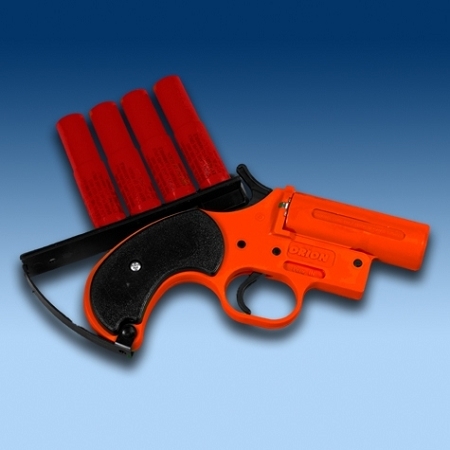 Preferring something a bit less hazardous to our health, we’ve always opted to carry a flare gun. 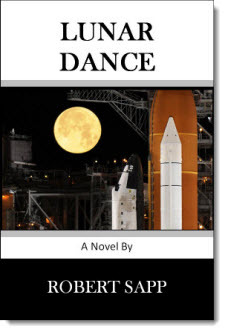 The flares are launched higher in the air where they can be more easily seen, and I have this crazy idea that in a pinch it might even make a handy defensive weapon if we ever needed to repel boarders. Now I know it’s all about safety, and assigning an arbitrary expiration date is probably the easiest way to ensure they’ll work if you need them. But that 42 month thing really bothers me. It bothers me because I’ve dug flares out of moldy boxes kept for years in a damp garage, flares that were 15 years past their expiration date, and they worked just fine. I’ve always hated being held hostage by those damn expiration dates. So we rebelled. And you can too. Here’s how to free yourself once and for all from the tyranny of emergency signal expiration dates. 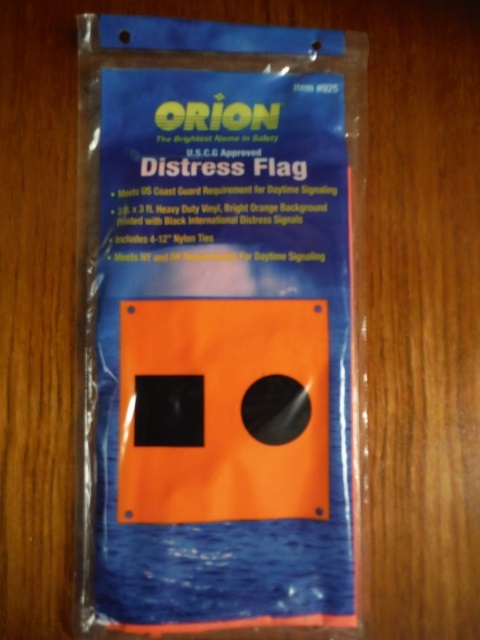 This is an large vinyl flag that meets the USCG requirements for a day emergency signal device. And it never expires! It gets better. See this? 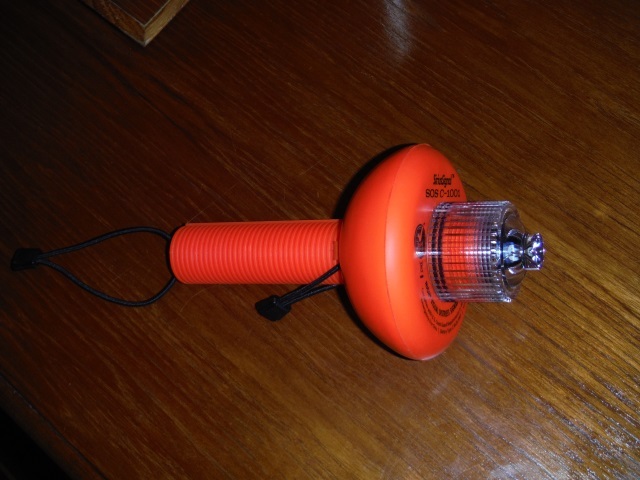 It’s a USCG approved night emergency signaling device. And it never expires either! Here’s a look at it doing its job. And it can do that for days, rather than minutes. Now I can hear some of you saying, “But you need to keep fresh batteries in it.” Why yes, you do. But a four pack of C cells is less than ten bucks and have an expiration of much greater than 42 months, while a fresh set of flares will set you back $30 or more. And IF the Coast Guard ever pays us a visit, all they’re going to need to see is that the device works, which I’m certain it would do. 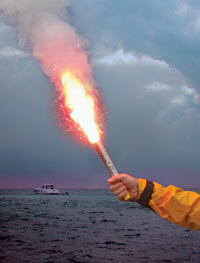 Unlike flares with their arbitrary expiration dates, as long as the light lights, there’s no fine. So OK, I’ll admit that as grand gestures go, this one probably wasn’t as significant as I let on initially. But it does feel so good to get out from under those darn expiration dates. And we’ll still keep the flare gun we currently have onboard. We’ll just no longer care when the shells it shoots were born. This entry was posted in What?, Why? on August 24, 2015 by Robert. It is probable in my opinion that there was a lobby group that figured into that 42 month expiration date. I’ve never had one over 15 years old but the ones I had that were that old worked just fine when we shot them off for the heck of it. I’m certain you’re right. The primary consideration was probably a thought toward safety heavily influenced by a large dose of “How can we sell the maximum number of these things?” When we bought our boat last year, she came with a stock of flares with late 1990’s expiration dates. Every one we tried worked fine. Don’t get me wrong, I’m glad these things last way longer than their expiration dates would imply. But it was worth it to us to no longer have to care.